Claire is probably the punniest person you’ll ever meet, even if the only person she consistently makes laugh is herself. She’s a fan of terrible dance moves, listening to the same song over and over (and over) and making awkward situations even more awkward. 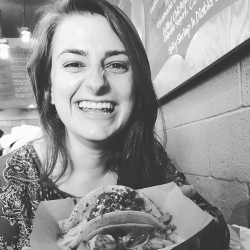 When she’s not hosting trivia, she can be found roaming the streets in search of the District’s cutest dachshund or trying new treats – she’s a huge foodie and always wants to taco ‘bout it.